Reflections and Ruminations: Why forgiveness is so challenging for many. Every one of us, to a man, finds ourselves at some point in time struggling with the issue of forgiveness, and particularly in giving it. The fact that we are not isolated individuals, but are inserted into community and society where we live and interact with other human beings makes it a real possibility of stepping on one another’s toes. Add to this complexity the fact that each of us is given a freedom to respond to our fellow human being in so many different possible ways increases exponentially the chances of misunderstandings, wrong or false perceptions and forms of social trauma. In these conflicting moments, when we experience hurt, forgiveness is the much needed balm and healing salve. However, there is an almost in-built resistance towards applying it. If we spend some time sitting with the issue or issues at hand, it won’t be long before we arrive at one or more of the following reasons for our unwillingness to forgive. 1. The person who offended me hasn’t stopped the pain or hurt. 2. He or she still hasn’t learned the lesson. 3. I still remember the incident vividly, and the pain is still there. 4. The person hasn’t changed. 5. No apology has been offered. 6. I don’t know how to forgive. 7. If I forgive, it will mean that I lost, and the other person won. I must confess that I didn’t interview anyone to come up with this list. All I did was to recall the many times that I had heard in the confessional the struggles that real people had with the issue of forgiveness. There are, of course, so many other reasons than those I penned, but these readily came to mind. Besides, I too, have found myself having some of these thoughts surging through my head when it was my turn to forgive those who have given me grief, distress or anguish in some form. The Christian approach to forgiveness has a certain dimension that goes beyond just being “nice” so that we can ‘get along with one another in life’. If we are not aware of what needs to underlie all our efforts at working at forgiveness, it will be something that we will resist doing, and not be affected by the fact that we have stored unforgiveness and bitterness in our heart. What is it that should undergird our efforts at forgiveness as Christians? It is none other than love. Christian scripture is redolent with verses that tell us to love our enemies. It does seem counterintuitive, does it not? Shouldn’t love ought to be reserved for those who make life easy and sweet for us? Why should I be extending a hand in love to those who are only too happy to slap me on the cheek? When our forgiveness of others who have hurt us is only going to be given if they fulfill certain criteria like those I listed, it means that our forgiveness is conditional, and not unlike a quid pro quo settlement. But when forgiveness is based on love, it changes dynamically not only the way we forgive, but the mind and heart that goes behind the act of forgiveness. We will be responding to that call from God himself to love our enemies. But with what kind of love? The purest kind that is defined as agape love, where one wills the good of the other, for the sake of the other. Forgiveness is always going to be challenging once we attach any conditions to it, because as human beings prone to sin, we are not very good at fulfilling conditions. This being the case, we are likely to injure the other person in a same (or similar) way at another point in time after this incident. Perhaps this is the reason why Jesus said to Peter that we need to not only forgive 7 times, but 7 times 77 times. It was the Middle Eastern hyperbolic way of bringing home a truth – that forgiveness cannot have a limit in terms of the number of times I need to forgive others. “But Father, whenever I remember the incident, I feel the anger and the hurt welling up side of me. What then?” When that happens, it doesn’t mean that you haven’t forgiven the person. What it most likely means is that you have a very good memory, and that you have somehow made this issue or incident important enough to enshrine it in your life. You’ve put it in a nice glass cabinet in a prominent place in the living room of your heart, and each time this memory is brought to the fore, you have taken trophy out of the cabinet, and cleaned and polished it again. “Then what should I do?” Well, when you feel the anger and hurt welling up in your heart, that is the time that you need to activate the forgiveness and apply it to the hurt and to the person whom you believe has caused it. If the hurt or the memory is triggered 5 times in a day, activate it each time. If it is triggered 7 times 77 times, activate it 7 times 77 times. We need to apply Jesus’ teachings in such a real way. “But I cannot forget it!” Nowhere in the teachings of Christ nor in the Scriptures do we see that forgetting is part of forgiveness. It is something that has been toxically taught by society at large that we should forgive AND forget. I disagree strongly with this, and have preached about it on numerous occasions. Forgiving is a virtue. Forgetting could well be a sign of dementia, and is hardly associated with virtue. Rather, it is when we can remember but that we choose to forgive each time we activate our forgiveness that we become virtuous and godly. Ultimately, forgiveness in the Christian sense, where we love our enemies, is going to be difficult because we are not ready to love in an unconditional way. We are so blessed to have in Jesus our model of forgiveness when we look at images of him crucified on the Cross. That he said while hanging there so innocently “Father, forgive them for they know not what they do” is such a model of unconditional love and an icon of love of one’s enemies. The next time you find yourselves unwilling to forgive, perhaps even setting up conditions for forgiveness, check to see if you have love for the one needing forgiveness. Chances are, you are going to find that you are running on empty in the love department, which is what fuels true forgiveness. I understand forgiving fr. But why prolong the agony of not trying to forget the incident? I understand that this is part of "loving" the other despite what the other has done. Still, do we wait till we are numb to the pain done? If the affront is small, it can be just easily disregarded. Why carry the unnecessary burden as we go through life? Wouldn't we be more loving to the person and to others if we have less baggage? Thank you and God bless Fr. Perhaps you have misunderstood what I meant when I said that we should not wait till we forget before we forgive. The common gripe that many have about forgiveness is that they predicate forgiveness on the ability to forget. This is not same as waiting till we forget before we forgive, which is what I think you are saying. Our activation of our wills to forgive others when the memory of the incident and the accompanying pain and anguish fills our hearts is an act of love that requires both effort and a striving. It doesn't mean that we need to actively make the past present again in order to forgive. That's just being masochistic and hardly has any virtue. "Nowhere in the teachings of Christ nor in the Scriptures do we see that forgetting is part of forgiveness. It is something that has been toxically taught by society at large that we should forgive AND forget." This tells me that we shouldn't forget the incident despite having forgiven the person. Forgiving someone but not forgetting the incident is like burying the hatchet with the handle still sticking out. I understand fr. about what you said regarding requiring an effort and a striving. It is part of being a Christian. And I also don't mean about being masochistic as you mentioned. 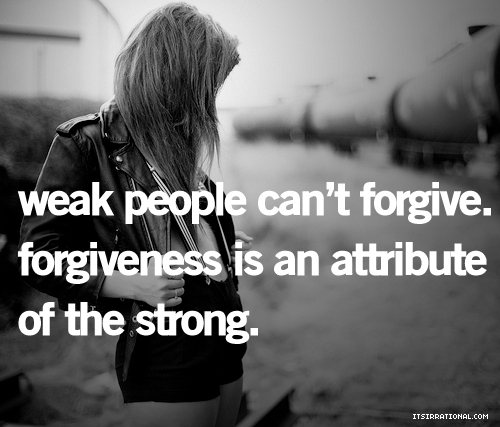 What i mean is, if you have forgiven the person, then you should also strive to forget the incident. It is in the past. learn from it if you can - or should - but move on. Same as loving the sinner but hating the sin. It is not part of the Church teaching to forgive AND forget. But it is part of being Christ-like to love as Christ loves us, which is with all of our being. Thank you, Fr. Luke, for your many teachings on this blog. This posting is very relevant to me as I had/have been hurt by some of my siblings many times. I may not be a charitable person but I believe that by following your blogs, I am slowly but surely changing my mindset and character. Thank you once again & God bless you, Father! I like how you described that forgiveness is a much needed balm or healing salve that we could apply to our hurts. The deeper the wound inflicted (normally the closer the person is to us) the longer it takes to heal. As human, we tend to replay the incidents over and over again in our heads, which needs a conscious effort to keep reapplying forgiveness each time. Indeed, it’s only by choosing to love unconditionally with the love of Christ, that we could completely forgive those who have wronged us. And only through the grace of God at work in us that makes it possible. May we all open our hearts fully to receive this grace. Thank you and God bless you Fr. Before I knew Christ, I was sold on the righteousness of “an eye for an eye...” till I came upon (Gandhi’s...?) non-retaliatory philosophy - “will make the whole world blind”. And I also held to the belief that “to err is human, to forgive is divine” - because it’s in man’s nature to make mistakes, since one can’t even know what’s round the bend but it has to be the Divine/God’s job to forgive because our nature is not magnanimous enough for the task. How mistaken I was! To know Christ is to love him; and to love him is to want to be like him; for we were told in Genesis 1:26 that we are made in God’s image and likeness, and again, in Rom 8:29.........if we love him we desire to be conformed to the image of Christ, who is Love. Then to quote you, “Christian scripture is redolent with verses that tell us to love our enemies...” - which means that forgiveness is a ‘non-negotiable’ when one is a Christian. Reflecting on your statement above that we have “to activate our forgiveness” and in so doing -“we become virtuous and godly” - I like this very much because it is so true when I look at Peter and Judas. Forgiveness was experienced by Peter when Jesus never once by word or look - blamed him for the betrayal - but actually gathered him and all the apostles together serving them a meal to show his tender love for them after His Resurrection. The beauty of what forgiveness has done for Peter. ........was that he became a transformed or “resurrected” man, no longer a cowering coward. I feel that he was able to do so because knowing the Lord has forgiven him, he was able to forgive himself, to accept his “un-godly” or weak self and resolved to forge ahead to give of himself totally to the Lord. On the other hand the account of Judas showed that he was appalled by his betrayal and sickened by his act he tried to make amends or cleanse himself by throwing back the thirty pieces of silver to the chief priests. However, his heart remained closed to God’s grace of forgiveness and so he remained lost. In this way, I feel that to be able to really forgive we need God’s grace, but the desire and initial step has to be taken by us, especially to activate again and again (like you said) , each time the heart pains at the memory of the betrayal or the wrong done. Reading and reflecting this has been an interesting adventure- thank you Fr. I wish someone had guided with similar wisdom much earlier. I learnt (through a very very long winded process with lots of struggling) that feelings are really unreliable when trying to forgive someone. I discovered forgiveness, like love is something you choose to do regardless of how you're still angry, still hurt, still disappointed.... with His help, we can take that step. The remembering will always be there but all the feelings that came along with it will eventually subside and then it get easier and easier to let them go. Not forgiving only eats at us, the people who have hurt or wronged us usually go on merrily along whether they are forgiven or not.